Life is Strange was about coming back. Max had left Arcadia Bay, her friend Chloe and a lot of problems behind. Returning to attend the prestigious Blackwell Academy, she found everything she had left was still here. You got the sense that Max wasn’t good at confronting her problems, so her arc through the game was mainly about learning to face the challenges she normally shied away from. Life is Strange 2 inversely, explores the need to run. The entirety of Life is Strange 1, and Before the Storm was set in one town. The Awesome Adventures of Captain Spirit was set in one house. 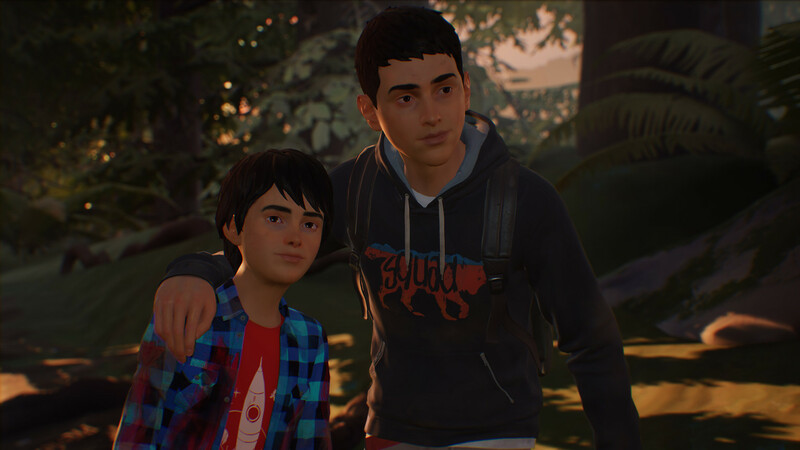 Life is Strange 2 promises to be a journey through several locations as two brothers attempt to escape what they cannot understand. The tragic first scene, which has been advertised heavily leading to the release, does not let you enjoy the tranquil boringness of the situation. Even if you have managed to avoid all the trailers and story speculation up until now, the game immediately hints at what’s to come. You have no choice but to walk through the sleepy home knowing that a tragedy is about to unfold around you. I’ll get into the story in a little bit but first, let’s just talk about the more technical end of things. The voice acting is superb, with both Sean and Daniel sounding believable and astonishingly emotive. On top of that, the graphical improvements from the earlier games in the franchise are on par with Captain Spirit. The world has incredible depth and detail and you can get a sense of the place and the people just by looking at the environment. Unlike the rest of Life is Strange though, this world feels the most animated, and that’s all thanks to Daniel. With childlike wonder and energy, he dashes around you, interacting with the environment on his own and constantly chattering. Although I can’t say I noticed it at the time, his inclusion has made the earlier games feel more like still life pictures that you walk through. On top of Daniel underfoot, you can now have conversations on the move, a touch that lets you explore the environment while progressing the story and characters. Although sometimes it does mean you’ll miss lines of dialogue as you interact just as conversation are starting. Okay, now let’s get into it. Life is Strange 2 Episode 1: Roads is a tremendously sad game, there’s no way around it. There are heart-warming moments dotted about, but these are small mercies in an ocean of sadness, and rarely do anything but build you up for a bigger fall later. You play as Sean, a young, talented and slightly directionless boy. But after certain events, you are forced to flee the safety of suburban life for the wilderness, taking with you a lot of emotional baggage and your little brother Daniel. Most of the game is devoted to how you interact with Daniel, and how you allow him to interact with the world. You’re his big brother and he looks up to you, especially in the relatively alien environments you find yourselves in. It’s up to you decide how he behaves and to keep him safe. Life is Strange 2 lets you do joint interactions in this regard, but like all the other titles in the series, they can have unknown consequences. Without spoiling anything of the story, it’s hard to talk about this episode without mentioning its political undertones. This is a game set directly in the aftermath of the 2016 presidential elections in America. It focuses on two non-white boys traveling through rural America and it does not shy away from the political climate of the time. While it doesn’t mention anyone by name, you will encounter the emboldened social tension that followed the election. The story slows down a bit in the middle, giving you the chance to focus on the characters and their relationships with each other. These moments really manage to put you in the seat of a big brother. You feel responsible for Daniel, constantly checking on him while feeling mildly annoyed by his constant chatter and lack of understanding of the situation. It seems like you can take the relationship in a number of different ways, being cold or even hostile to Daniel if you so choose. As a little brother myself, I had nothing but sympathy for Daniel and didn’t dare upset him unduly. But you do have to make difficult decisions, occasionally putting survival over happiness in a way that is extremely difficult to explain to him. Some of the calls you have to make are painfully hard to choose, and unlike Life is Strange 1, you don’t get to explore but options before making a call. It’s a game that has a constant, low-key pressure each time you play, but sometimes I’m not sure how well it works. Life is Strange 2 has something akin to survival mechanics, too. You have a wallet with some money and the occasional option to shop. Here you can buy resources like food, water and sleeping bags, provided you can afford it. But the game tries to make you consider your spending, though I’m not sure how well the threat pays off in a narrative game. If you arrive in one location completely broke, I assume the game won’t just end there. But that is probably the most negative thing I have to say about Life is Strange 2. The developers at DONTNOD have evolved their formula, taking the players of the old game right of their comfort zones into something surprising, beautifully crafted and always intriguing. While it does make allusions to Arcadia Bay, it looks like this is a brand new adventure and one well worth checking out. Reviewed on PlayStation 4 (code provided by the publisher). You can purchase the game for PC at a discount via Green Man Gaming and for Xbox One directly via Microsoft Store. Life is Strange 2 strikes out on its own with the first episode, Roads. In an amazing and captivating debut, we meet the new central characters and begin an immensely interesting (and sad) tale we can't wait to continue.